At the Global SSD Summit, Samsung is pushing solid state drives as not just the technology of the future, but the technology that users need today to keep up with the speeds available wired and wireless technologies. With new protocols, such as USB 3.1, Thunderbolt 3, Wi-Fi 802.11ac and 5G mobile broadband, hard disk drives pose as the bottleneck to the computing experience. Traditional hard disk drives rely on the SATA III protocol, which is capped at 6Gbps. Up until 2015, this speed was more than sufficient. Hard drives based on the SATA II and SATA III protocol could keep pace with existing wired and wireless standards, like USB 2.0 and USB 3.0 and Wi-Fi 802.11n. However, as PCs begin supporting newer, faster standards, for the first time in computing history, the venerable hard disk drive isn't able to keep up. New computers today are beginning to support faster technology, such as USB 3.0 and USB 3.1, Thunderbolt 3 and Wi-Fi 802.11ac. These technologies bring faster data transfer speeds than SATA III's 6Gbps cap. For example, USB 3.1 can transfer data up to 10GBps, and Thunderbolt 3 can reach speeds up to 20Gbps, speeds in excess of SATA III's 6Gbps. In the future, 5G mobile broadband, the technology that will replace 4G LTE, allows data transfers up to 1Tbps. With these faster speeds, SATA III and the hard drive that relies on this data connection protocol will become obsolete, said Ryan Smith, Senior Product Manager of SSD Marketing at Samsung Semiconductor. New Samsung solid state drives rely on the non-volatile memory express, or NVMe, protocol, which delivers faster CPU to data storage performance and reduced latency. Smith says that this is the technology of the future, as SSDs that use NVMe can keep up with the wired and wireless technologies available today. The benefit to an NVMe-based drive is that these SSDs are able to process multiple queues of data, and as such are suitable for workstations and servers. This allows servers to process simultaneous I/O requests. Samsung highlighted live broadcast video as one example where SSDs are more suitable than hard drives. In a presentation, Peter Morrone, Senior Vice President of Product Engineering for Chyron, described the process for which graphics are overlaid on top of live video feeds. One example of Chyron's technology is live animations and graphics on sports broadcasting. "We've used a variety of different storage media," Morrone said, "But SSDs have made such a significant impact on our business: time to market, time to manufacture and provide a better user experience"
In the past, graphic overlays were done in post-production, meaning they weren't available for live broadcasts. However, because NVMe allows Chyron partners to process multiple queues of data simultaneously, a video feed can be downloaded, edited and uploaded while another clip uploaded. This reduces downtime and allows for live broadcast with real-time graphic overlays. SSDs allow sports broadcasters to fulfill their goals, Morrone said. Broadcasters are able to deliver a better user experience by telling better stories with better visuals. Samsung estimates that the global demand for NAND memory this year alone is 84 billion GB, and that this number will more than double by 2019 to 209 billion GB of data. Smartphones are the primary drivers for memory consumption today, but SSD growth will outpace smartphone memory consumption moving forward. Consumers are paying more attention to SSDs for its increase in reliability, capacity and performance, according to Samsung's research. 38% of consumers shopping for a notebook know what an SSD is, and one in three laptops today ship with an SSD, which is made possible due to the declining cost of storage. For example, the average cost per GB for SSD storage is about $0.38 in July 2015. Samsung intends on shipping 13 million of its own branded V-NAND SSD this year for the after-market segment. 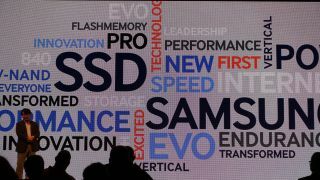 V-NAND is Samsung's new branding for 3D-NAND.